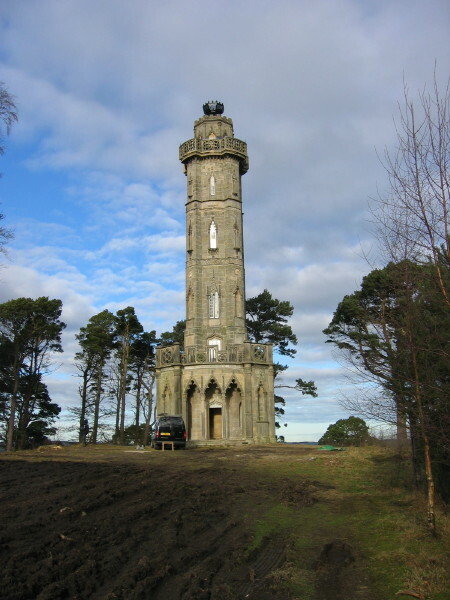 An ornamental tower, dated 1781, and thought to have been designed by Robert Adam for the first Duke of Northumberland, although it is also attributed to the duke himself. It is in an elaborate Gothick style and was built as a viewing platform for Alnwick Castle park. The tower has six stages, the lowest of which has a verandah and the highest a balcony. The tower is capped by a cast iron fire basket. The tower is . (Look around! I have measured out all these things; they are my orders, it is my planting; many of these trees have even been planted by my hand). I was commissioned to carry out an analysis of the paint on the windows and doors. The external and internal face of the windows and doors appear to have been painted thirteen times. It seems that both faces were painted in the same colour on the majority of occasions when decoration was carried out. The first three schemes were in a greyed white. A series of dull greens, warm stones and browns have been used subsequently. I have also worked at Syon House, another house belonging to the Duke of Northumberland.